Scarification is a thatch control and pruning technique which helps to keep the lawn healthy and promotes a thicker, lush lawn, reducing the risk of disease, weeds and moss issues. Over time your lawn develops thatch – a fibrous matter made up of dead parts of the grass plant including the crown, stolons and rhizomes. Without removing this dead matter your lawn will quickly deteriorate, making it especially vulnerable to moss, disease, weeds and stress in periods of drought. What is the purpose of thatch? Thatch keeps the grass plant cool in hot weather and helps your soil retain warmth when it is cold. Without thatch your lawn will be baked dry when it is hot and become muddy in the wet. How much thatch should my lawn have? As a general rule of thumb we’re looking for a quarter to half an inch of thatch at the start of the year. Why can too much thatch be a problem? If your lawn has too much thatch not only will it suffer from disease, weeds and poor water and nutrient penetration, left to its own devices thatch will start to build in your lawn where the grass starts rooting to it. A lawn with a lot of thatch might feel spongey under foot, it could also be difficult to cut as the mower will sink into the lawn potentially causing scalping issues. Once this happens your lawn is at a critical situation as the grass grows roots into the thatch to survive because this is where the water a nutrients are stored, not in the soil which will be dry and nutrient deficient. What are the benefits of scarification? 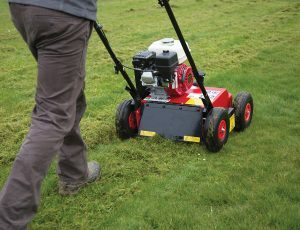 Regular scarification will strengthen your lawn against moss and weeds, encouraging thicker growth. Renovation scarification is an essential part of the autumn work for moss heavy lawns, (September is usually best) in preparation for the winter months. At this stage of the year, if lawns are showing signs of moss, the scarification process is used before a moss killer has been applied. There is a common misconception that the moss needs to be killed before scarification. It is unlikely that all the moss is killed when applying moss killer, so scarifying after applying moss killer puts your lawn at risk of spreading moss spores, which are invisible to the eye, back across your lawn – rather counter intuitive! When is the best time for scarification? Simply, the perfect time to scarify is when the grass is growing strongly. We’d avoid scarifying your lawn when frost may occur and in dry conditions as it will take your lawn longer to recover, putting it at unnecessary risk to deterioration.